The ATtiny85 is programmed using the Arduino environment with either an Arduino Uno or a dedicated programmer. It's necessary to define the ATtiny85 core so the Arduino IDE knows about its pins. Be aware there are a couple of different libraries for the ATtiny85 that treat the ATting85's internal registers differently. 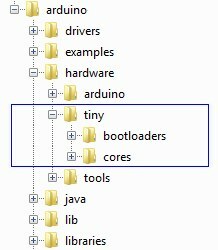 The library I used in the Arduino brakelight Sketch is arduino-tiny. The 'README' included in the downloaded zip package contains full instructions for installing it into the Arduino IDE. There are dozens of websites detailing how to use the Arduino Uno as a programmer - particularly for the ATtiny85 - so I won't repeat them in detail here. When the Arduino Uno is acting as a programmer, it's necessary to disable its auto-reset circuit. To do this, connect a 10uF capacitor between RESET and GND on the Arduino Uno board (Capacitor negative to GND). The capacitor 'absorbs' the auto-reset pulse from the USB/serial and prevents the Uno's ATmega328 seeing it. 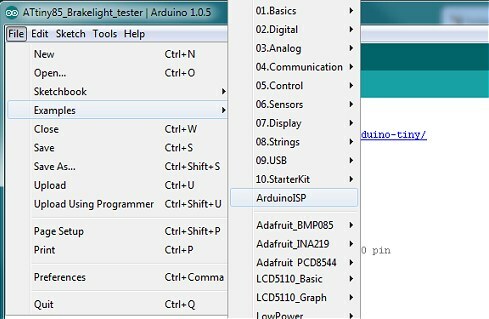 From the Arduino Tools menu, select Programmer | Arduino as ISP. Power up the Arduino Uno (with the USB cable), ensure the correct COM port is still selected and, from the Tools menu, select Burn Bootloader. This doesn't actually burn a bootloader in the ATtiny85 but it does set the internal fuses to match the board type we selected in step 5. 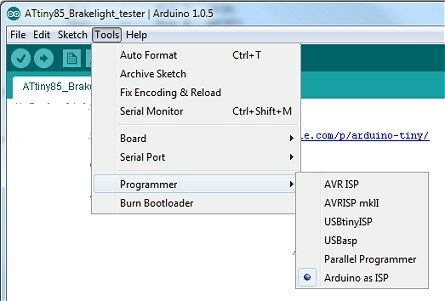 Finally, load the brakelights Sketch into the Arduino IDE and hit Upload in the usual way. You will see the errors shown below. They only apply if you're using an external parallel programmer so it's safe to ignore them. The ATtiny85 should now be successfully programmed with the brakelights sketch. If you use an external stand-alone programmer, such as the one shown here, most of the steps are the same except, as you won't be using the Arduino Uno as the programmer, the 10uF capacitor isn't used and the wiring to the ATtiny85 is already in place. Also, the programmer will already have the ArduinoISP loaded. If you want to try some of the simpe Arduino examples before you program the ATtiny85 with the brakelights sketch (for example, the Blink example), remember that the pinout on the ATtiny85 is completely different from the ATmega328 used in the Uno. ADCSRA = 0x80;                               // ADC to on.
} // ATtiny85 returns to setup() ?